The Marist congregation’s youth shelter Casa da Acolhida Olho d’Água has been running for less than three years. 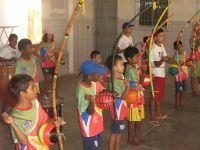 Its Percussion Orchestra is called to play at events, gatherings and parties throughout São Luis, the capital of the state of Maranhão, besides playing a key social role in poor communities. The lack of experience of the orchestra’s members is more than compensated by the unique added value it creates by revitalising Afro-Brazilian rhythms and artistic expressions typical of Maranhão, a transition state located between the impoverished semi-arid northeast and the Amazon jungle region. Seventy kids and teenagers participate in the orchestra of the Casa da Acolhida of the regional division of the Marist congregation, Provincia Marista. This Catholic organisation is devoted to the education and social advancement of young people, and is active in 78 countries around the world. The social unit in Olho D’Água, a poor neighbourhood of São Luis, is one of seven youth care centres run by the Marist brothers in Brazil. Band members play a range of percussion instruments, including a variety of drums and tambourines, panderos, atabaques, agogós, reco-recos and many other instruments with peculiar names, in addition to the berimbau, the bow-shaped instrument that generally accompanies performances of capoeira, a martial arts dance form developed by African slaves in Brazil as a way to defend themselves. Some of the members focus on one instrument, others play several, and those who show a true vocation are encouraged to further their musical education at a conservatory, Maria do Amparo Seibel told IPS. Seibel coordinates activities in the large facilities of the Casa da Acolhida, where rehearsals, meetings and classes take place. Sonielson Pinheiro dos Santos, 15, is one of the teenagers who passed the conservatory selection and plans to study Spanish guitar. After two years at the Casa da Acolhida Olho D’Água, he is already a “monitor,” which means he teaches percussion to the newer members, and has been identified as one of the promising young talents. Pinheiro dos Santos says that when he grows up he wants to be an “architect, a capoeira instructor and a percussionist.” He explains that he only joined the Casa da Acolhida group after much insistence from his mother, but that he now realises what a good opportunity it was for him. He tells IPS how it taught him to have better relationships with others, including his teachers, and how it helped him improve his grades at school. But kids also come to the Casa da Acolhida Olho D’Água to learn and do many other things, like sing, dance, act, practice capoeira, draw, paint and sculpt. The Percussion Orchestra brings them all together and provides quality support to the other activities. Last year it put on a show called “Singing and Story-Telling”, based on Maranhão folk tales, for which it won prizes at the state Children’s Theatre Festival. The Marist project incorporates many of the “transformation-through-art” initiatives that are spreading throughout Brazil, but its core goal is more socially oriented, aimed at improving the quality of life, school performance and opportunities of children and teenagers in poor and low-income neighbourhoods. The kids who are taken in are not forced to attend school regularly or deliver good grades, but they are guided in their school activities and supported in whatever difficulties they face. On weekdays they go to the Casa da Acolhida after school hours, and on weekends they can take tutoring classes if they need to. As word of the benefits of this alternative learning experience spread, more and more families wanted their kids to be a part of it, and the centre was forced to make a selection, limiting the number of kids taken in to 70 and giving priority to the most vulnerable, Seibel says. The city of São Luis has seen the worst escalation of youth gang-related violence in Brazil, with battles between rival groups leaving a high death toll. “Our work is aimed at prevention,” says Seibel, a social worker whose efforts have helped many poor communities from around Brazil, including different favelas (shantytowns) in Rio de Janeiro, where she spent eight years. The centre’s teenagers all agree that what the Casa da Acolhida needs now is a swimming pool to make up for the few spaces for outdoor enjoyment that exist in the neighbourhood. Besides the musical and artistic education it provides, the centre is helping these teenagers discover qualities and skills that they did not know they had in them. One example of this is Cristina dos Santos Ficente, 15, who admits that until she came to the Casa da Acolhida she was a hostile girl who often got into fights, and that here she has discovered her leadership qualities. “We are the main characters of our own stories; we have a right to have a say in things, and a right not to be brushed aside,” she says. Santos Ficente was elected to participate as a delegate in a Forum that discusses issues that affect children and teenagers. “I started seeing the world differently,” she says. The new knowledge and skills these kids acquire and the opportunities that open up for them stimulate teenagers like Gustavo de Souza, 16, who has discovered an interest in the music, legends and traditions that inspire the shows put on by the Casa de Acogida. One of the things he learned, for example, is that “Olho D’Água,” which is the name of the neighbourhood and literally means “Water Eye,” evokes the tears shed by a legendary indigenous girl who lost the man she loved. There are some who excel in capoeira, like Vinicius Melo, 14, who sees in this combination of dance and sports a way to “defend yourself and respect others,” and an added skill to make dummy passes in football.